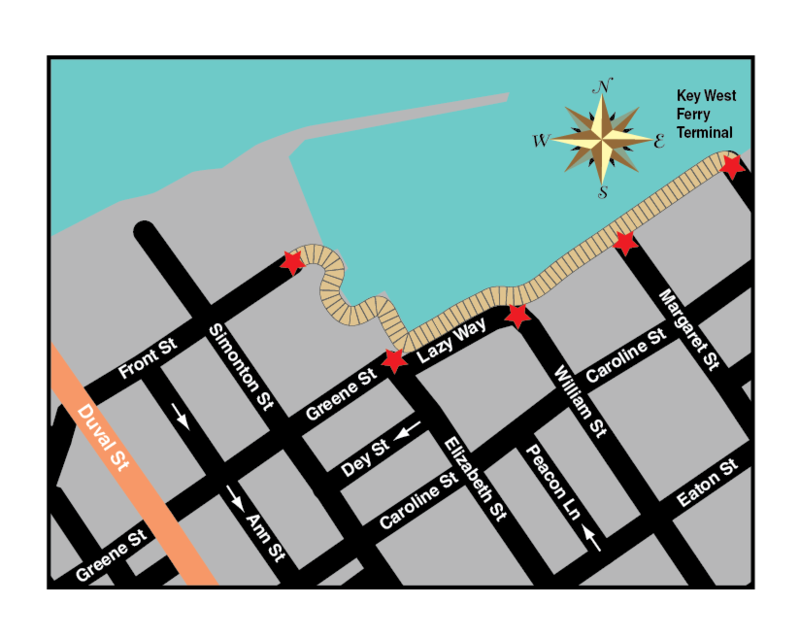 Key West Historic Seaport is located along the harborwalk waterfront at the ends of Front Street, Greene Street, Elizabeth Street, William Street & Grinnell Street. Key West Historic Seaport offers a variety of transportation options for arriving at the Seaport as well as getting around while you’re at the Seaport. From walking, biking, Conch Electric Cars, the Conch Tour Train and Old Town Trolley Tours there are plenty of ways to see the Historic Seaport. Shuttle service is also available from the Key West International Airport and visitors can easily use one of the above methods to and from the cruise ship terminal which is only blocks away from the Historic Seaport. 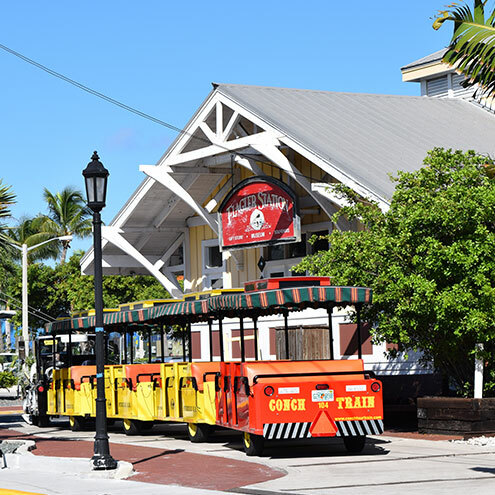 Shuttles, Conch Train and Trolley Tours run daily with stops located just steps from the harborwalk waterfront at the Historic Seaport. For an easy and free way to get around Key West, hop on the Duval Loop bus! 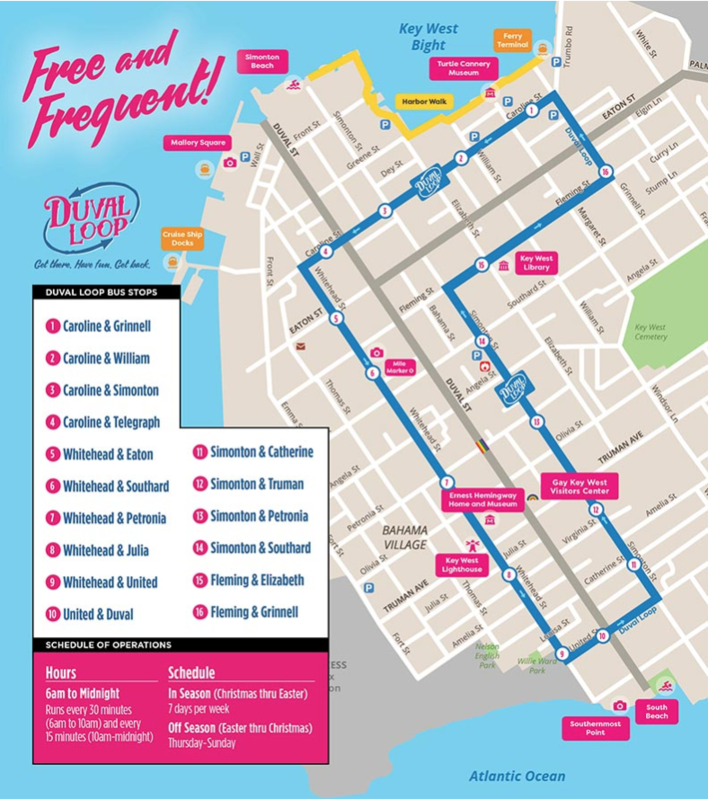 The Duval Loop is a bus route runs from the Gulf to the Atlantic adjacent to Key West’s world-famous main street lined with shops, bars, restaurants and all more. Hop off to go explore the island and hop back on to get to a new adventure. The Duval Loop bus runs every 15 minutes from 10am-midnight and every 30 minutes from 6am-10am. Check out the Real-time bus tracker. We encourage visitors to walk or bike while in Key West but rest assured the Key West Historic Seaport has ample parking for guests arriving by automobile. Pay stations are located at exits on each floor. Special rates apply at large festival events. Ride the Duval Loop for free. Loop stop in 900 block of Caroline. Your Park n Ride Garage ticket entitles you, and everyone in your vehicle, to ride the City Routes of public transportation in the City of Key West for FREE. Just present your ticket stub to the bus driver when you enter the bus. Free City bus service is only available until the expiration date printed on your ticket stub and is not applicable to the Lower Keys Shuttle service. Bus stops are located on Caroline Street in front of West Marine, across Caroline for downtown service, and just west of garage for outbound service, for your convenience. Numerous bus stops are located around town, ride the bus all day! For more information on bus stops, routes, and schedule times, please visit kwtransit.com. $3.50 per hour; $20.00 per day with a maximum 10-day purchase. Any vehicle transporting a person with a valid handicap placard or plate is allowed by State Law to park for 4 hours without paying in municipal pay to park areas. All parking is “pay and display”. You purchase parking time at pay stations and display the receipt face-up on your dashboard. For moped; motorcycle and open air vehicles please tear off the perforated stub and retain as your proof of payment should the receipt blow away. Pay stations are located in the center of each lot and accept coin or credit card. Pay to Park Enforcement is Monday through Saturday 8AM to midnight; Sunday noon to midnight. All other parking regulations are 24/7. There is a charter bus drop off and parking lot in the 900 block of Caroline Street. There are 7 spaces. $100.00 per day or $1,500.00 per month; drop off is free. Please check City’s Website for charter bus information for large festival events. Temporary parking and drop off areas may be created due to number of buses. Key West is part of the Florida Keys archipelago. It’s also Florida’s southernmost point, lying roughly 90 miles north of Cuba. Visitors can fly into Key West International Airport (EYW), Miami International Airport (MIA) or Ft. Lauderdale-Hollywood International Airport (FLL) and from there can reach the seaport via shuttle buses or rental cars. Flying travelers can reach the gateway to Key West airport in about an hour from Fort Lauderdale or Miami. Visitors can fly to Key West International Airport via connections or direct flights from many cities. The airport offers a host of ground transportation options, including local shuttle buses and rental cars. 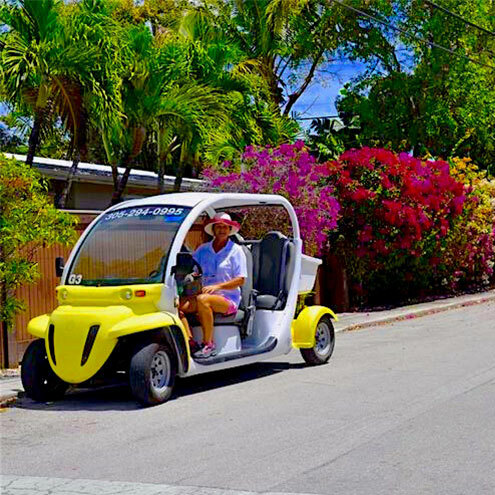 Getting around Key West is fun and easy! Taxis and Key West Transit buses serve Key West International and are conveniently located curb side at the terminal. Visitors can now fly into Florida Keys Marathon International Airport aboard on-demand small charter aircraft. Ground transportation is available in Marathon including airport shuttle buses, taxis and rental cars. General aviation enthusiasts and corporate jet operators will also find plenty of services. Drivers can reach Key West on one of the most breathtaking drives down US-1 Overseas Highway in about 3 ½ hours from the Miami/Ft. Lauderdale area. Enjoy the beautiful scenery and relax on your way from Miami to Key West traveling on a motor coach with Wi-Fi, restrooms and other amenities. There are multiple pick-up locations from a variety of hotels in Miami and one-way and round-trip tickets available. 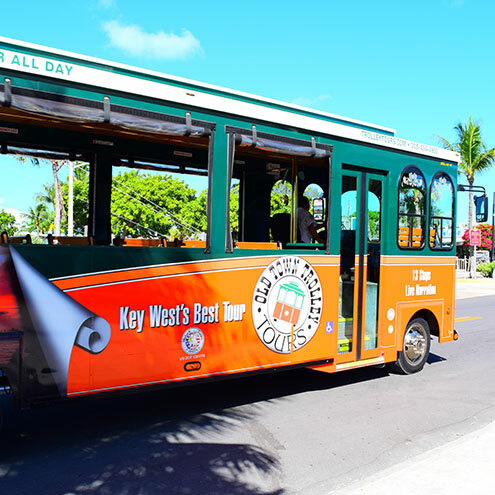 Take advantage of great deals on dining and entertainment at the Key West Historic Seaport that are provided to you on the bus. Visitors from Florida’s West Coast can hop aboard the Key West Express Ferry from Fort Myers Beach and Marco Island. Please note that the Marco Island ferry service runs seasonally and operates only during the winter months. You will enjoy cool air-conditioned interiors, couches, tables and reclining airline-style seating so you can ride comfortably. Consult with a local expert in the visitor center now located in the Key West Ferry Terminal at 100 Grinnell Street at the Key West Historic Seaport. Visit VacationKW.com for more information or contact an experienced sales agent at 800-595-5397 or 305-295-9500.